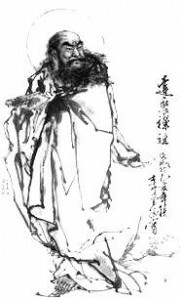 Bodhidharma traveled from India to introduce Zen (Ch'an)to China. Historically, Bodhidharma was the 28th patriarch of Gotama Buddha. Nevertheless, he was the founder of the enlightenment approach now known mostly by its Japanese name, Zen. Bodhidharma was also known as Tamo and Daruma. He travelled the distance from India to China over treacherous ground...but for what? After years meditating on Chinese soil he had an encounter with the man who would not only become his first disciple but the first beneficiary of his Zen. His name was Huike. He was seeking a means to pacify his mind. Bodhidharma did not make it easy for him. Those who awaken are often compelled to go to great distances to stand with others. Only a few people will understand why they travel. Even fewer people will directly benefit from their journey but the trip is worth it. If a single soul understands, if only one person receives without blocking, no distance is too far to go. I observed the world travelling of my own Spiritual Teacher, Sadguru Sant Keshavadas but I never suspected that one day that same spirit would also draw me to many parts of the world to share The Way, its power and its peace, its love and grace. Why did Bodhidharma comes to the West? For me the answer is simple...to dance in Maastrich, Holland.